“The Old Mainer and the Sea” is a children’s book about the hardship and magic of life as a Maine fisherman in the late 1800s. It is a story, like Ernest Hemingway’s “The Old Man and the Sea,” about how what the sea brings you can transform you. Unlike Hemingway’s story, however, “The Old Mainer” is uplifting with heart, sure to appeal to small children. 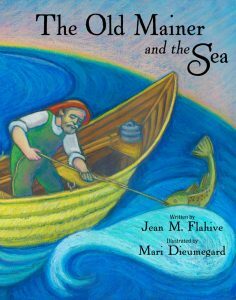 “The Old Mainer and the Sea” is an exquisite collaboration, written by Maine author Jean M. Flahive, and illustrated by Mari Dieumegard. The story, though tight, is an expansive tale, fable-like, about how what truly matters in life is not what happens, but how one responds, especially to the unexpected. The artwork by first-time book illustrator Dieumegard dreamily captures the narrative of Eben Weber, who lives with his wife, Della, on Chebeague Island. Every day he rows his dory 6 miles to Portland, with his fishing hand lines out to catch cod that he sells in town. The oils and pastel illustrations are bright and mesmerizing, simple in composition but wonderfully resonant of the storyline. “The Old Mainer and the Sea.” By Jean M. Flahive. Illustrations by Mari Dieumegard. Islandport Press. Oct. 24, 2017. Hardcover. 32 pages. $17.95. 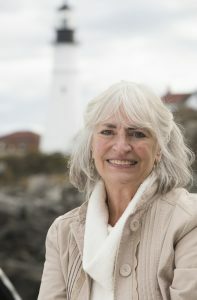 “The Old Mainer and the Sea” was written by Jean M. Flahive. The book tells the fictional story of a day in the life of real-life Mainer Eben Weber, who did, in fact, live on Chebeague. In “The Old Mainer and the Sea,” he sets out, as he always does, alone in his boat, the Hunky Dory. He carefully cuts away the snarled lines and releases the porpoise to swim free again. Farther in his journey, Eben becomes lost in the fog, is nearly capsized by a large schooner, loses an oar and finds himself in dire circumstances. All is not lost, however. The porpoise returns. It guides him safely to port, where he can sell the day’s catch before rowing home again. Dieumegard, who has a BFA from the Maine College of Art in Portland, has long wanted to illustrate a children’s book. Five years ago, she began sending solicitations to editors and publishers with examples of her work. She sent one to Islandport Press in Yarmouth. Two years later she received a phone call asking if she was still interested in illustrating a book. “I was excited by Jean’s manuscript,” she says. “When I read it, I saw the visuals as whimsical with a dreamlike feel.” For Dieumegard, an elementary school librarian, working on the book was a dream come true. “The Old Mainer and the Sea” may owe a small debt to Hemingway, but it is distinctly its own story. The book is a visual delight with a captivating story, a magic combination for young children.